Please note that the content of this book primarily consists of articles available from Wikipedia or other free sources online. 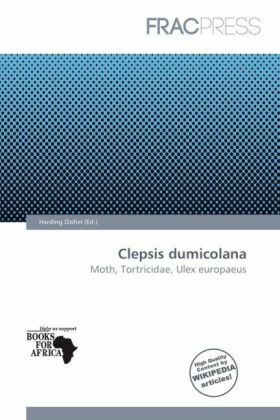 Clepsis dumicolana is a moth species of the family Tortricidae.It is found in Spain, Italy, Belgium, The Netherlands, Germany, Switzerland, Austria, Slovenia and in the Near East. The wingspan is about 20 mm. The adult moths fly from mid-May until October. The larvae feed on Hedera helix.In biology, a species is one of the basic units of biological classification and a taxonomic rank. A species is often defined as a group of organisms that are not capable of interbreeding and producing fertile offspring. While in many cases this definition is adequate, more precise or differing measures are often used, such as similarity of DNA, morphology or ecological niche. Presence of specific locally adapted traits may further subdivide species into subspecies.